Join me for two mornings of cordage, twining, looping and hopefully some beautiful original wearables to take home or gift. Book online with The Happenstore. A collaborative site specific installation of 32 umbrellas by 23 artists from Basketry NSW. A variety of basketry styles, techniques, materials and fibres have powerfully interwoven the concept that women are resilient, string, passionate individuals who can provide and gain protection, courage and strength thorough togetherness. "In celebration of International Women's Day, North Sydney Council invited 74 women artists to participate in a series of exhibitions to be held at six Council venues throughout the month of March. Both emerging and established artists have been showcased including artists from Primrose Paper Arts, Basketry NSW, the Iranian Women Visual Artist Collective, Bridget Kennedy Project Space, Coal Loader Artists Studio Programme and category winners of the North Sydney Art prize among others. The artists have developed works in response to the colour 'red' as a colour associated with the earth, energy, strength, power, action, determination, passion, desire and love. Artists have responded to the curatorial theme with great imagination exploiting a range of media including installation, sculpture, new media, mixed media, printmaking, textiles, basketry, paper making and contemporary jewellery. This significant cultural event provides a broad view of contemporary visual practice whilst celebrating women's resilience, creativity and ingenuity." I am very excited to be part of 'Spring', a group art exhibition from the first until the 3rd of September at The Happenstore, Annandale. I will be participating in this year's Artisans in the Gardens. "A celebration of the natural world, Artisans in the Gardens, now in its 17th year, brings together an extraordinary range of artwork. The exhibition showcases some of Australia’s best established and emerging artists and craftspeople with over 2,000 artworks including sculpture, ceramics, hand blown glass, jewellery, textiles, plus so much more." Every Wednesday at the Happenstore - 55 Parramatta Rd, Annandale. 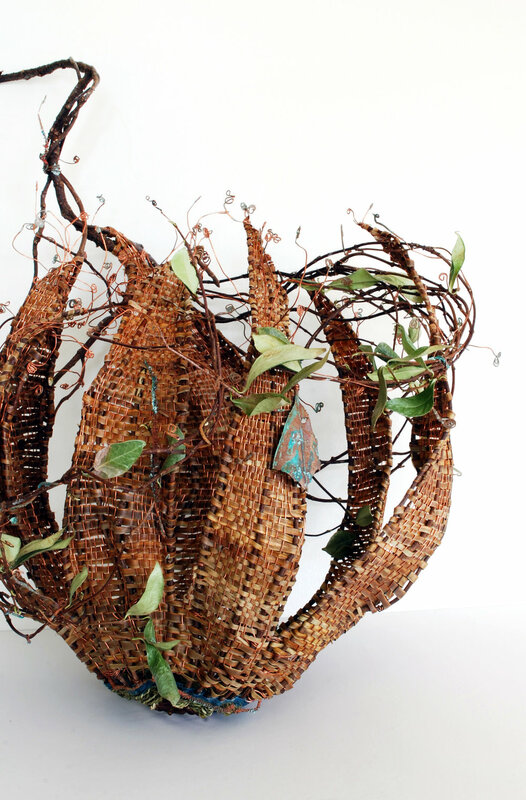 I am a member of Basketry NSW. We currently meet monthly (second Friday of the month from 11 am) at Primrose Park Art and Craft Centre in Cremorne, Sydney. We welcome casual visitors - $10 - so feel free to drop by and see if this might be a group for you. Typically we bring a current project and our lunch and some morning tea to share if so inclined. While it is more social than a workshop environment, everyone is wonderfully generous and I learn something new every month. Drop me an email if you would like to know more or enquire directly online basketrynsw@gmail.com. Links to other basketry groups are also available on the Facebook page. Spanish, "The moment after eating a meal when the food is gone but the conversation and wine are still flowing." My first exhibition with Brenda Livermore.